Improving Pointing Performance with Concurrent Input Channels. We investigate the use of two concurrent input channels to perform a pointing task. The first channel is the traditional mouse input device whereas the second one is the gaze position. The rake cursor interaction technique combines a grid of cursors controlled by the mouse and the selection of the active cursor by the gaze. 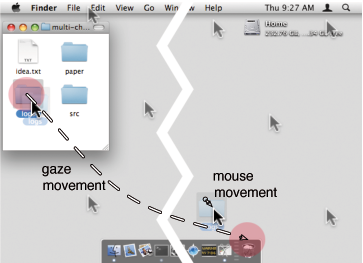 Multiple cursors drag- (left) and-drop (right). The gaze selects the active cursor (red discs figuring the gaze position added, cursors magnified). A controlled experiment shows that rake cursor pointing drastically outperforms mouse-only pointing and also significantly outperforms the state of the art of pointing techniques mixing gaze and mouse input. A theory explaining the improvement is proposed: the global difficulty of a task is split between those two channels, and the sub-tasks could partly be performed concurrently. A video showing the Rake Cursor interaction technique is available. Rake Cursor code is available under the GPL-compatible free software CeCILL version 2 license. Renaud Blanch and Michael Ortega. Rake Cursor: Improving Pointing Performance with Concurrent Input Channels. In Proceedings of CHI 2009, pages 1415-1418, Boston - Massachusetts - USA, April 2009.